Sunday night’s Super Bowl may not have broken any TV ratings records, but it broke new ground for consumers who preferred to stream the game online. 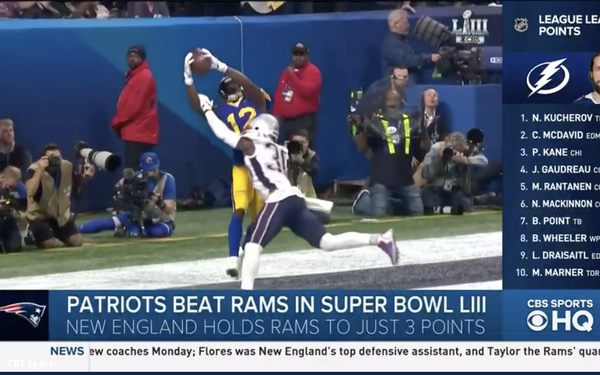 CBS says the game drew an average minute audience (one of the closest digital metrics to the Nielsen average viewership standard) of 2.6 million viewers, up 31% from last year’s Super Bowl, and a new streaming record. That means that at any given minute, some 2.6 million people were streaming the game online. CBS says 7.5 million unique devices streamed the game, up 20% from last year’s game, consuming a total of 560 million minutes of coverage. Those numbers came despite some technical issues impacting select Roku users. The stream of the game was more widely available than it has ever been. It was available for free on CBS Sports’ website and apps, the NFL’s digital properties, Verizon’s media properties, and the ESPN Deported digital properties, as well as on linear TV. CBS also says the Super Bowl shattered a number of records for its CBS All Access subscription streaming service. The company says it set a new record for subscriber sign-ups, unique viewers and time spent, though it declined to offer specific figures. The previous single-day sign-up record was spurred on by the launch of the new “Star Trek” series for the streaming service. CBS used the Super Bowl as a platform to promote All Access and its upcoming reboot of "The Twilight Zone." While the streaming numbers are good, they paled in comparison to the linear TV viewership, which averaged around 100 million viewers. As more consumers connect streaming devices to their TV sets, and as mobile viewing options become more plentiful, those streaming figures are expected to rise. 4 comments about "Super Bowl Sets Streaming Viewership Record". Nicholas Schiavone from Nicholas P. Schiavone, LLC, February 5, 2019 at 2:21 p.m.
1. The game was lame. The commercials were tame. The halftime show was halfbaked. 2. The New England Patriots are not the Dallas Cowboys. Give Brady his due, but ... .
3. Defensive Games do not draw "Offensive" Audiences. Casual NFL viewers lose interest. And if they lose interest in the Big Game what chance does a Big Commercial have? Finally, lest we forget, it is highly probable that Nielsen cannot, or will not, measure all of the historically high streaming audience that CBS/NFL made possible in at least 4 legitimate ways. Nielsen is likely using the audio encoding technology of 1995 to measure the visual audience of 2020 and beyond. Sponsors who paid $5 million per :30 must demand more and better from Nielsen. Like Super Bowl LIII, this Nielsen Game has gone on for too long. Douglas Ferguson from College of Charleston, March 1, 2019 at 7:58 a.m. Here's the real headline: "More people not using over-the-air signals"
Ed Papazian from Media Dynamics Inc, March 1, 2019 at 9:03 a.m.
Douglas, did you notice how tiny the streaming audience was relative to the "linear TV" audience? As for over-the-air TV reception are you aware that this segment of TV homes is growing at a pretty fast clip, not shrinking? Nicholas Schiavone from Nicholas P. Schiavone, LLC, March 1, 2019 at 11:12 p.m. Please note that my reference a month ago to "historically high streaming audience" was not an expressed or an implied reference to a "proportionately" high streaming audience relative to the Super Bowl LIII's "total" (average minute) audience. More important is the fact that Nielsen and the Industry must bring substantially more reason, order, and transparency to the chaos of today's TV audience measurement in toto.